We’re on the verge of PDX Beer Week, a celebration of beer, food, and community. But for just a moment, let’s discuss those alternately clever and confusing beer advertising campaigns, past and present. I have to admit that as a youngster, it was the enchanting beer signs, with neon waterfalls and impossibly foamy heads, as well as other ale artifacts like belt buckles and T-shirts, that really fueled my desire to give up my former life as teetotaler—at age 15. Are there any beer campaigns from days gone by that you were particularly fond of? Please share. What was it that made you pick up your first cold one? 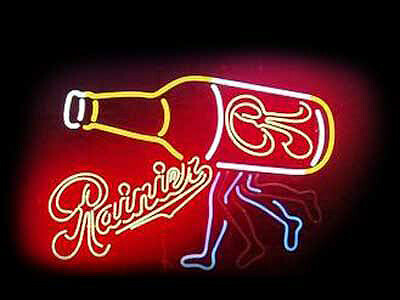 I myself dug those old Stalking the Wild Rainier ads from the late ‘70s and early ’80s. I just seem to remember beer culture itself as something I really wanted to be a part of, and it was the iconic nature of the branding that really did a number on me. The Schlitz Malt Liquor Bull; the Hamm’s Bear; and more recently, the Most Interesting Man in the World from Dos Equis. All of them like gods to me. By the way, if you have a serious yen for browsing through vintage breweriana, check out these fine fellows. I’m also a fan of Newcastle Brown Ale—especially on tap. For some reason, bottled Newcastle doesn’t cut it, for me. Anyway, here is a fairly cool video depicting the creation of a Newcastle billboard in Brooklyn. If all beer signage was this thoughtfully produced, the world would be a better place. After all, that beer ain’t gonna sell itself. Or maybe it will.